Monday, Apr. 8, 2019, 7 – 8:30 p.m. The Department of Near Eastern Languages & Civilization's Farhat J. Ziadeh Fund, and the Middle East Center at the Jackson School of International Studies at the University of Washington. Professor McAuliffee is the Senior Advisor to the Librarian of Congress and President Emeritus, Bryn Mawr College. 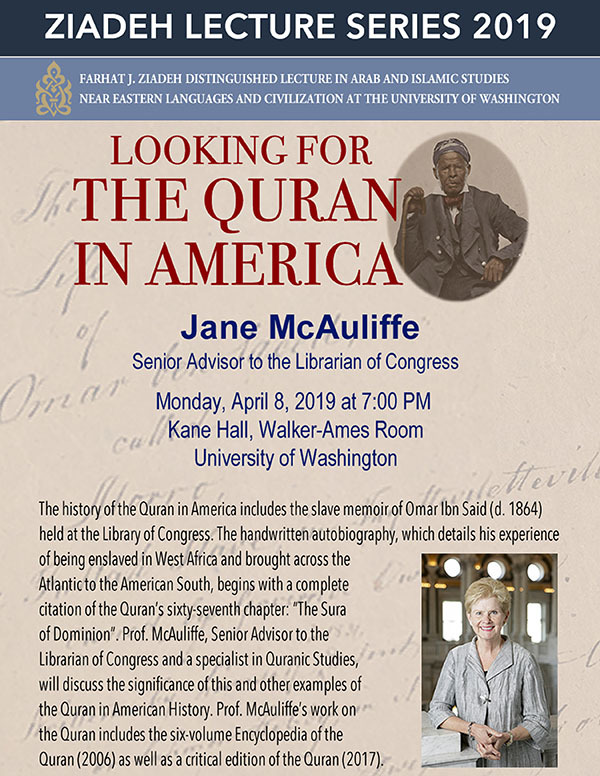 As a specialist in the Qur'an and its interpretation, McAuliffe has produced the six-volume Encyclopaedia of the Qurʾān and continues to lead the editorial team for the online edition of the work.